2. Click the “Ranking” button on the main tool bar or go to “Tools/Web Ranking” menu item from the pull down menu. 3. Select the “Keyword” from the list, or type in a new one. 4. 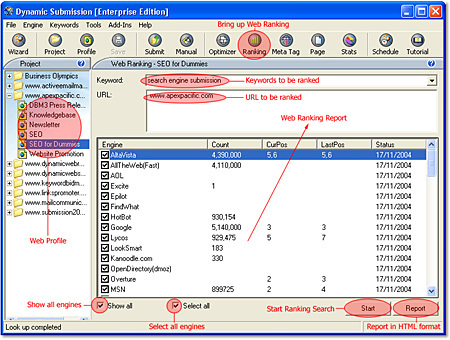 Select the Search Engines that you wish to have your URLs checked, or simply use the checkbox to select all the engines. Once search is completed, ranking result will be shown within the main window. Click the "Report" button at the bottom to generate and view the HTML ranking reports in your default Web browser.